Residential Cleaning– Far and away something that everyone can use is residential cleaning. If you have a residence, you can use some residential cleaning! With the busy schedules of today’s individuals and families, it can often feel like something has to give. Why not let someone pick up the slack with the cleaning so that you can enjoy your rare free time? Special Event Cleaning– If you plan special events, you know that the cleanup can be the exhausting cherry on top of a delightful party sundae. The bigger and better the event, the more help you’ll need with the cleanup. That’s where special event cleaning comes in! Move-in/Move-out Cleaning– Moving is a stressful situation, especially when adding the prospect of losing money on your deposit due to inadequate cleaning. Whether you want a fresh start before you move into a new place or want your deposit back, this type of cleaning service is invaluable. Deep Cleaning Services– For spring cleaning or a deep cleaning overhaul, deep cleaning services can make daily cleaning that much easier to maintain. 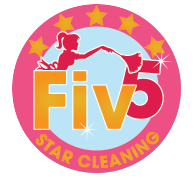 If you are looking for cleaning services like those mentioned above that you can rely on, contact our expert cleaning team here at Fiv5 Star Cleaning today.